After traveling for nearly a decade straight, some places had begun to blend together for this seasoned traveler. Once she landed in the Republic of Georgia on a solo trip, however, she discovered that hospitality and welcome are a deep part of Georgian culture. After traveling for nearly a decade straight, some places blend together in my memory. Travel is my way of life and so these travel experiences form the bedrock of my days, meaning it’s easy to allow even the most interesting experiences to fade into the fabric of daily memories, instead of exceptional ones. I had seen so much beauty in the world and tried to never take advantage of the gift of traveling for years on end, but it wasn’t until I arrived in the Republic of Georgia that I realized there was a spark I had been missing for years—an unknown part of the travel experiencethat, once found, reignited my love for travel. 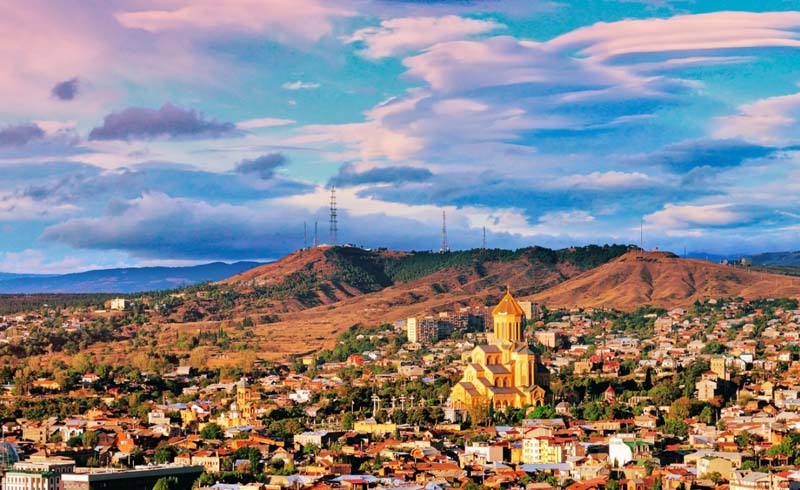 Most international flights that land in Tbilisi—the capital of Georgia—land in the dead of night, and mine was no exception. My taxi cruised through the quiet city and I squinted into dark, attempting to glean some first impressions in the dim light. I had two weeks of solo travel, and I had rented an adorable Airbnb for the two weeks—there were plenty of things to do in Tbilisi and as day trips from the capital city, so I would explore from there. 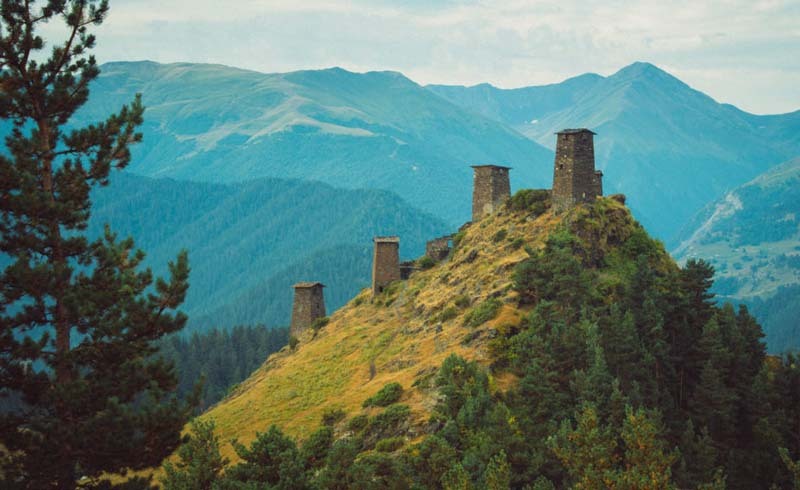 My pre-trip research eased my mind about my travels and got me excited about the fascinating sites to see: The Republic of Georgia is safe for females traveling solo, and I was looking forward to the country’s beautiful nature and fascinating monasteries dating back centuries. It’s safe to say these were my main reasons for choosing Georgia—which is surely a more off-the-beaten-path destination—but I hadn’t expected so many other aspects of the culture to utterly charm me. Once dawn broke over the city, I took to the cobblestone streets and wandered through the neighborhoods of Old Town Tbilisi, each apartment building flowing into the next with wooden latticed balconies dating from the mid-1800s. Locals raised a hand in greeting as I passed, and when I slipped into a cafe and stammered through a conversation in mostly pantomime it attracted the attention of a neighboring table. Before I knew it, my chair was sidled up to their table as we shared bread, drinks, and conversation. I left thinking it was surely an anomaly, this fascinatingly open welcome and hospitality I had experienced at breakfast. But later in the week, I would learn it’s inherent—it’s a core part of the Georgian culture. A statue of Mother Georgia, Kartlis Deda, stands watch over the city and is visible from most parts of Old Town. In her hands she holds two items: a sword and a bowl of wine. These two things perfectly encapsulate the Georgian approach to hospitality—come as a friend and locals ply you with wine and welcome, come as an enemy and you meet the tip of her sword. While this makes a fun story, it’s also a value so deeply instilled in the culture that hospitality is essentially a byword for the Georgian people. Over the coming days, the Georgians would overwhelm me with welcome. One evening I wandered to up the Narikala Fortress and the Mother Georgia statue, both brightly lit and beaming from the hillside. As I looked out over the landscape, I heard the hum of a capella music tinkling over the night. Intrigued, I followed the sounds until I found a group of locals enjoy drinks and companionship as they sang traditional Georgian songs together. I stood a polite distance and listened, their harmonies so beautiful that I couldn’t pull myself away. One woman noticed me and beckoned me closer, passed me a drink, motioned to an open spot on the wall, and just that easily I was welcomed into the fold and invited to be a part of their evening. It stands as one of my favorite memories and I can easily conjure the sound of deep baritones from the men and higher melodies from the women as they sang patriotic songs about Georgia. This memory is just one of the many that infused my weeks. In Georgia, wine and welcome are the natural state of things and it’s impossible for me to think of a single moment when I didn’t feel as if the Georgian people wanted me to see and experience the best their culture and country offer. My one-year round-the world adventure that kicked off my life as a traveler was a whirlwind of new perspectives, personal discoveries, and incredible adventures. After that first year, travel had hooked me and I knew I had to take advantage of remote-based work. I wandered for years, and along the way I slowed down. The travel experience shifted away from the constant newness and I know I had begun to take advantage of some things. The simplest things had changed for me over the years. Instead of my trusty 65L Eagle Creek backpack that I had carried around the world around for six years, I opted for a roller bag—this change suited my decision to focus on slow, immersive travel experiences. And yet even traveling slowly, it took the charm and welcome of Georgians to remind me that the best travel experiences are often less about anything you could have planned, and instead those moments that take you by surprise. Transformative travel experiences are rooted in the connections and links built between the traveler and a country’s communities, history, and culture. Sure, Tbilisi is beautiful, but that alone isn’t what helped me find the unknown missing from my travels. It was sharing wine and song on a mountaintop with brand new friends and sipping tea with a local I met through Instagram who went out of her way to help me love her country. It was feeling a part of something new, something beautiful and falling a little bit in love with the Georgian culture. It’s a crush that endures and that now reminds me to step into new travel experiences with an eye toward what unknown awaits me on the other side of that next plane flight. Your turn travelers: What country or experience helped you find your unknown?